IMMACULATA, Pa. (CNS) — Sister Lorraine McGrew was installed as general superior of the Sisters, Servants of the Immaculate Heart of Mary, along with other members of the congregational leadership team, at a ceremony in the chapel of the Villa Maria House of Studies in Immaculata. 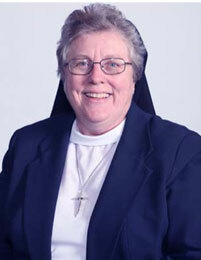 Sister McGrew and her team will provide spiritual leadership and guidance for a six-year term and oversee the work of more than 800 sisters who currently staff schools in Pennsylvania, New Jersey, Connecticut, Virginia, Georgia, North Carolina, New Hampshire, Florida and in Peru. Members of the Sisters, Servants of the Immaculate Heart of Mary also are involved in parish ministries and in diverse outreach activities. Installed June 17 along with Sister McGrew were Sister John Evelyn DiTrolio, sister assistant; Sister Rita Maria Lenihan, secretary general; Sister Marie Anselm Cooper, treasurer general; and general councilors Sister M. Patricia McDermott, Sister M. William Therese Byrne and Sister Mary Ellen Tennity.